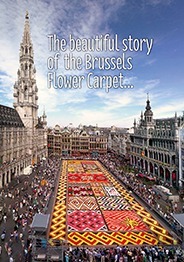 One fine day in 1970, strolling on the Grand-Place at Audenaarde, two aldermen of Brussels, Mr. De Rons and Mrs. Van Den Heuvel, were admiring a pretty floral carpet and decided the same thing should be done in Brussels. In 1971, on the weekend of August 15th, the carpark on the Brussels Grand-Place was cleared, and the first floral carpet, fresh and bright, with ornamental motifs, appeared. The second one was created in 1976, and was not unlike the first one, the theme of which was “Year of the Landscapes, Parks and Gardens”.